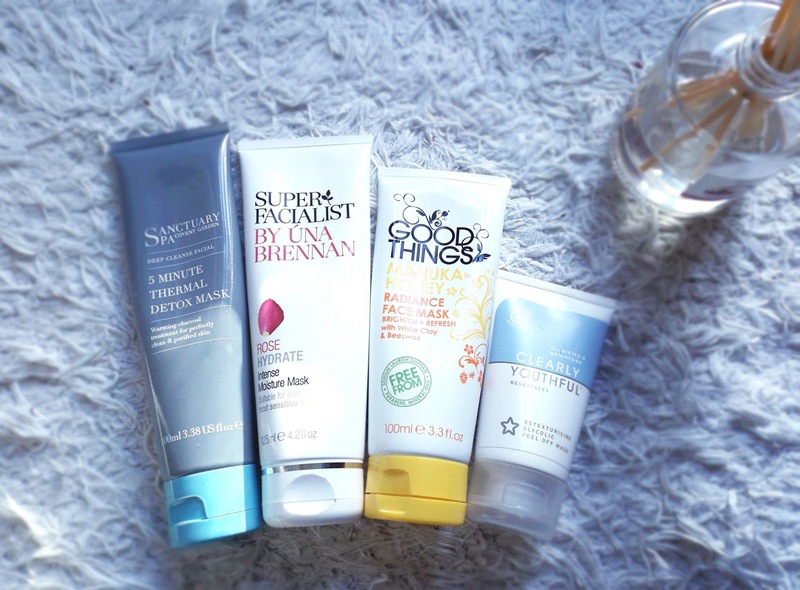 Being an integral part of my skin routine, I thought I'd share my small face mask collection. For me, it's the perfect size as there's one to tackle every skin issue I face whether congestion, dehydration or dullness. First off we have the lovely Sanctuary 5 Minute Thermal Detox Mask. A self heating mask containing both charcoal and kaolin clay really gets down into those pores and clears them out without that being overly drying. After long days with the slap on, I always grab this as it does the job right and so affordable too - it will keep you going for a while. My midweek treat. Next up, for those overly dehydrated days when the wind has been extra cruel: Una Brennan's Rose Intense Moisture Mask. Now if you love rose, you're going to love this - super nourishing, leaving your skin really supple and hydrated. The consistency definitely takes some getting used to as it's fairly 'bitty' and doesn't apply particularly smoothly. However, this doesn't stop it from doing its job - gets rid of that dry, tight feeling within 10 minutes. Couldn't be without. For a more heavy duty clay mask, look no further than this Good Things Manuka Honey Clay Mask. Whilst the white clay purifies your skin, the beeswax and honey helps counteract that drying effect some clay masks can have whilst also enhancing your radiance levels. You definitely get that extra clean feeling after cleaning it off, but I don't feel tight or dehydrated - 5 minutes is more than enough. It's one to give a go if you're on the market for a clay mask. I love this brand. Last but not least, a fab Superdrug number: the Clearly Youthful Glycolic Peel. This really is a hidden gem and I could not recommend this highly enough. If you don't have an acid toner in your arsenal, you need this. Its effects are immediate, leaving you with baby soft skin; getting rid of that nasty dead cells and the perfect canvas for your serums and moisturisers. Maximum dosage of salicylic acid and added cimicifuga for those shine prone, you're looking at one powerful, effective mask. I haven't tried the REN version, but I really don't see how it could be any better. The fact it's often out of stock speaks for itself. Plus you get the fun and satisfaction of peeling it off. Mmm.